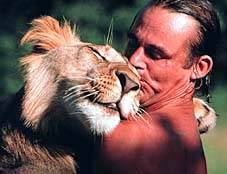 In 1975, one of the wild lions near George Adamson's camp inexplicably attacked Tony Fitzjohn, biting him through the throat. The lion was driven off and the badly mauled Fitzjohn was carried back to camp, bleeding heavily. "Am I dying?" he asked when he regained consciousness. "I think you probably are but I'll do my best", George Adamson replied. 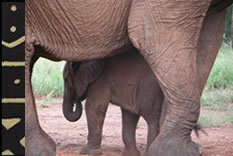 Fortunately for African wildlife conservation, Fitzjohn survived. Clearly, it will take more than a disgruntled lion to put paid to this extraordinarily tough and determined Englishman. Tony Fitzjohn does not fit comfortably into our modern world. He is an adventurer born out of his time, a restless spirit driven by a lifelong passion for the wild. At the age of 22, he threw up yet another dead-end job and hitchhiked to Kenya. His only ambition was to work with animals and, as luck would have it, he pitched up one day at George Adamson's camp at Kora. To George's delight, Fitzjohn turned out to be a natural with the lions. Within days of his arrival, he had to dominate an aggressive male lion, armed with nothing but his own supreme self-confidence and the sheer force of his personality. So began a working partnership (with Adamson) which lasted nearly 18 years. During their time together, they successfully reintroduced more than 30 lions and 10 leopards into the wild. More importantly, perhaps, they also pioneered the development and management of the Kora National Park, setting up camps, creating airstrips and cutting more than 300 miles of bush roads, as well as fighting numerous battles with ivory poachers and Somali bandits. The Adamson years were invaluable to the young apprentice, Tony Fitzjohn. It was at Kora that he acquired the knowledge and expertise he now brings to Mkomazi. Kora was a tough school, but it made Tony an expert in capturing, collaring and radio-tracking Africa's top predators, as well as raising and returning them to the wild. The challenge facing him at Mkomazi demanded all these skills, and more. It required someone who was an experienced wildlife manager, fluent in Swahili, a bush pilot, a skilled engineer and mechanic who could build roads, cut boundaries, strip down and re-assemble 4WD vehicles and plant machinery, set up two-way radio networks, construct and de-silt dams, maintain electrical and power equipment, organize anti-poaching patrols, deal with the bureaucracy, and keep a remote camp supplied. All this, and the ability to establish breeding programs for highly endangered species whilst simultaneously constructing and repairing schools in the villages in the vicinity of Mkomazi Game Reserve, helping with medical dispensaries and maintaining positive relations with the local communities. Fortunately, having spent the last 30 years living in the African bush, Tony Fitzjohn is uniquely qualified to fulfil all of these tasks. The modern day requirements of an operation such as this, staffed only by volunteers, make it necessary for Tony Fitzjohn to spend much time travelling in order to raise funds and create awareness for the project. This can take the form of lectures at the Royal Geographical Society, schools, zoos, wildlife parks, or differing size groups of supporters. He has also testified at a Congressional Sub-Committee hearing in Washington, DC, on behalf of the Tanzanian Government, on wildlife issues. In a life committed to the conservation of East Africa, he believes that Tanzania can provide an unrivalled refuge for some of Africa's most endangered animals.